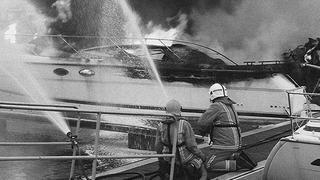 Boat fires invariably lead the vessel being heavily damaged or destroyed, because theyre left to burn. Marine insurance is a complicated matter, which works in a different way to domestic or commercial insurance policies. But purchasing it, and knowing how to buy superyacht insurance, and more importantly how to avoid invalidating it, is vital in case the worst happens to your vessel. I well remember an early August morning some years ago chuckling about a story on the BBC of a man who, without explanation, found himself numb from waist down in the middle of a large gorse bush on the cliff face at Primrose Valley. He had been stuck for two days. I remember thinking what stupid situations people get themselves into. It was about that time that I received a call from a client telling me that his yacht had run aground on a small island. The captain had fallen asleep on watch and apparently had placed a waypoint in the middle of the inconvenient island, which the yacht struck. The yacht was travelling at some considerable speed at night in waters known to be island-ridden. Thankfully no one was killed or injured, but the yacht was a total loss. As I said, people do stupid things. As I write this article, newspapers and television screens are filled with the images of the forlorn and tragic Costa Concordia. It would be unfair to pass judgement on the circumstances but, the loss of life, the potential loss of a 450 million vessel and the potential environmental impact will be matters for all sorts of claimants and the owners marine insurers to settle. It is reported that the cruise line might have self insured. It is not unusual for owners to assess their risk and the cost of an insurance premium and cover the risk themselves. I have seen it amongst yacht owners. But generally, self-insurance is not really an option. When a client is buying a yacht for the first time, he often wont give much attention to the nature of marine insurance. Today, a lot of domestic insurance polices are standardised. When you insure your car and you compare premiums you know what you are getting, and you pretty much know the risks that you are insuring and the ones youre ignoring. It is often the case that a new yacht owner will ask someone in the business to sort out the insurance for him, such as his captain or yacht broker. They get some quotes. The owner will just compare premiums and buy the cheapest insurance, or get three quotes and go for the middle quote thinking that the policies are pretty much the same. This is muddleheaded thinking. Yachting insurance is not an afterthought; it should be your second thought. When you decide to buy a previously owned yacht, the very next call you should make is to an insurance broker, or two. Get them to explain what they are offering and the price. If you have two quotes, put those quotes in front of an independent expert, perhaps a marine insurance lawyer, who can explain what you are covered for and what not. A fantastically competitive quote may not look so attractive after a good poke and see. Ask your friends or advisers what their experience has been when they make a claim. Are their insurer helpful? Do they make you fight for every penny? These are important issues. Also ask why an insurer is being recommended. If your captain is pushing insurer A over insurer B, is a commission being paid? It is not unheard of. Dont be embarrassed to ask the question.